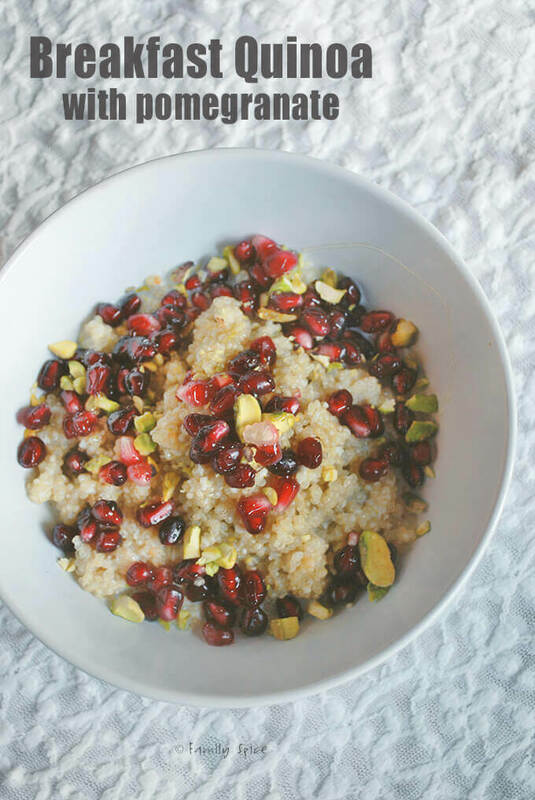 Pomegranates are incredible nutritious and are a wonderful way to bejewel your breakfast, especially a bowl of Breakfast Quinoa with Pomegranate. 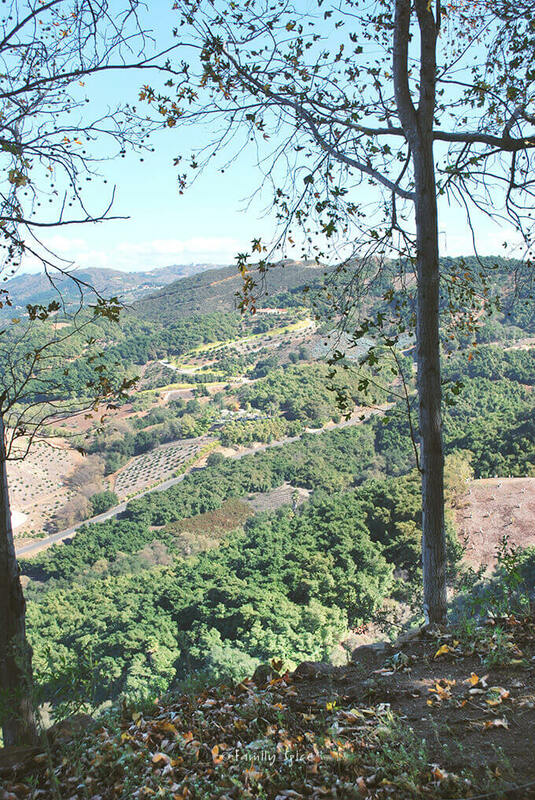 About a month ago, my family and I travelled an hour north of San Diego to Fallbrook, on a mission to visit an avocado orchard. The ranch belongs to the parents of a good friend of ours. And being the recipient of many of my recipes to taste-test, he was kind enough to arrange our visit. Although most of the avocados were picked, it was November, there were many still left on the tree waiting for the next picking. But we weren’t there for the avocados, at least not this visit. We were there to pick some pomegranates. 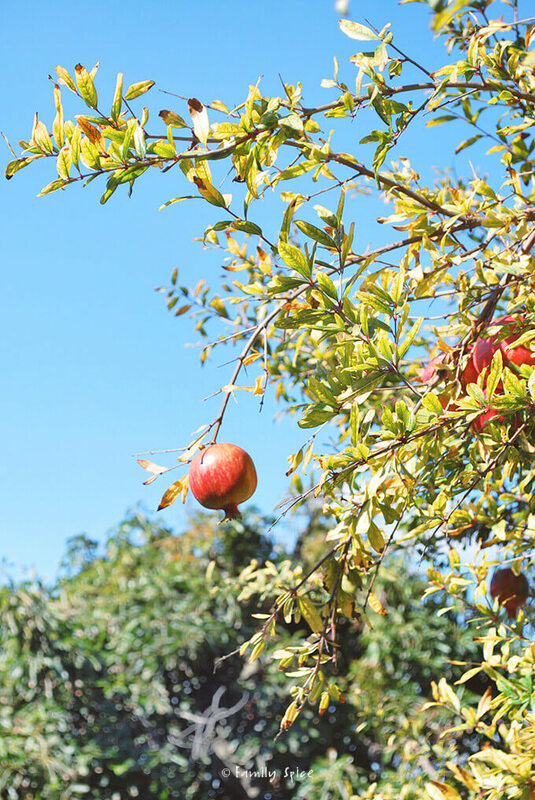 Our friend, Don, told us that when his parents bought the ranch, they planted other fruit trees for their own use. This included navel oranges, Valencia, tangerines, grapefruit, lemons, limes, apples and others. I was in heaven. 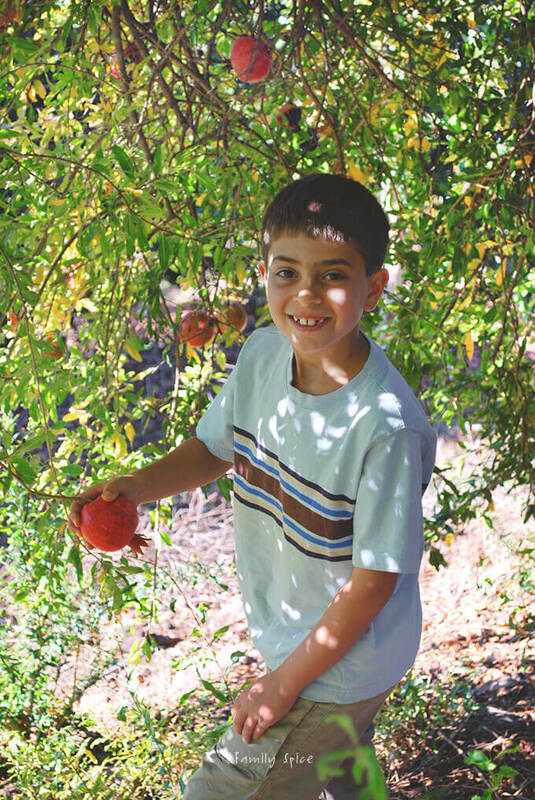 The story continues with Don convincing his family to plant a pomegranate tree. But, every year he and his family would eat only a couple pomegranates, using a few as decorations for the holidays. Most were picked by birds or would fall to the ground and left to rot. That’s a loaded statement in our book. As many as we wanted?! We picked the tree bare. The kids had an absolute blast. 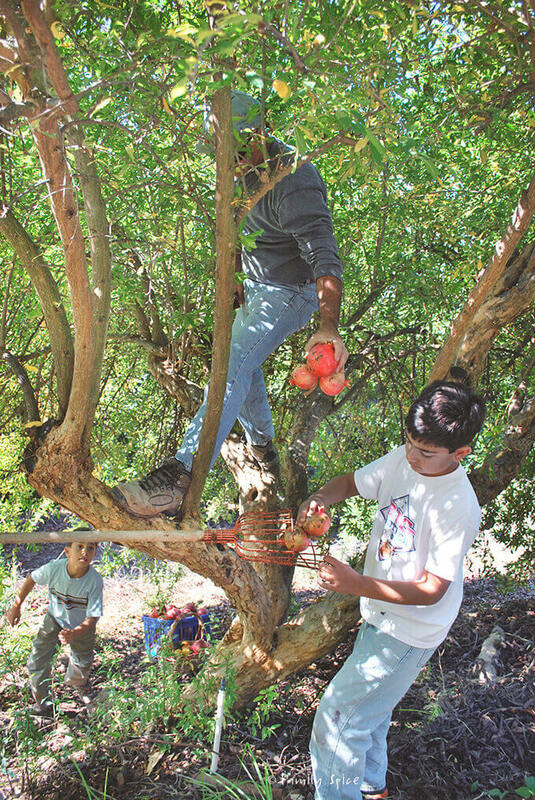 They were small enough to crawl up the snug spaces in the tree and pick the pomegranates. My husband would get the fruit they couldn’t reach and my youngest would pickup any pomegranates that landed on the grass. It was a real family affair! We showed our gracious hosts the best way to seed a pomegranate, and my hubby quickly seeded a few. He’s become quite at ease to shucking pomegranates after last year’s POM experience. 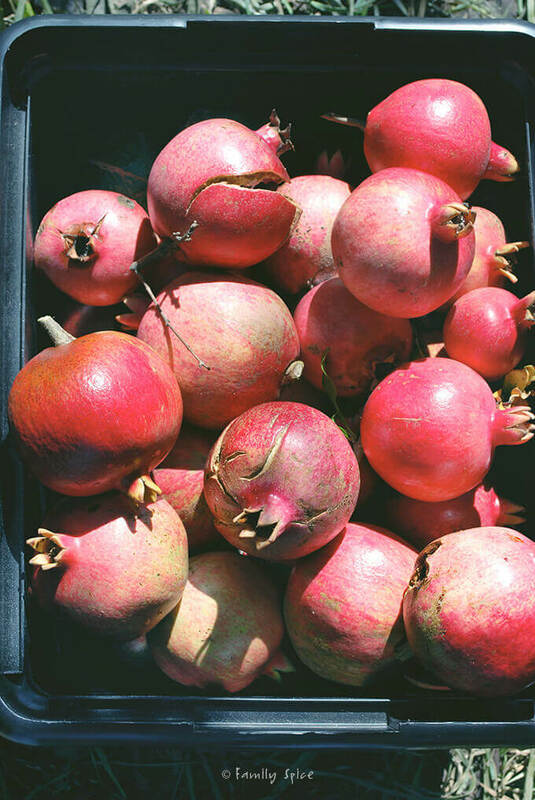 I also have a video to show you how to seed a pomegranate quick and easy. The kids really loved the eating the pomegranate seeds straight out of the husk. Our view was spectacular and the weather perfect. It was a wonderful way to end a positively fun and unique experience. After hauling about 200 pomegranates, several dozen limes, oranges and grapefruits, and of course, some avocados, we thanked our hosts and returned home. The kids were giddy with excitement. They adore pomegranates. This weekend, my husband finished seeding the last of the pomegranates, staying up ’til 1am to finish the job. We’ve juiced more than half of it, (sending a bottle to our friends) and have about a gallon of juice in the refrigerator now. We’ve spent a month enjoying our ruby red fruit in almost everything. I’ve already shared my Whole Wheat Pomegranate Scones with you. I have also made some Pomegranate Banana Bread. Today, I have a few more treats. One is a Pomegranate Smoothie. Smoothies are real popular in my house, The kids want them all year long and I am always mixing different fruit combinations with the changing seasons. 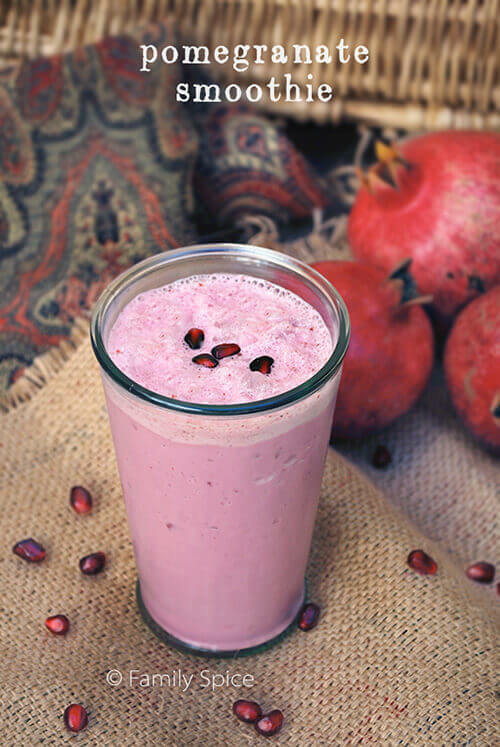 This smoothie is made with thick Greek yogurt, pomegranate juice, a banana and pomegranate syrup (or honey). Another great way to start your morning is with Breakfast Quinoa with Pomegranate (pictured at the top of the post). Quinoa isn’t just for salads or pilafs. 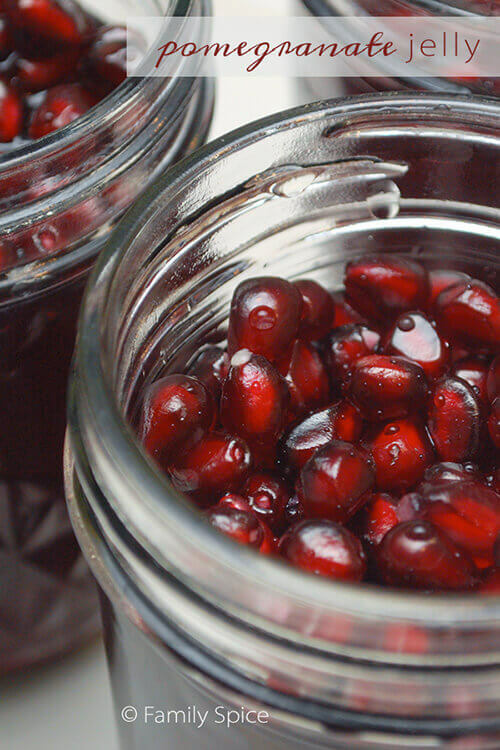 Or even some Pomegranate Jelly for your breakfast bagel. 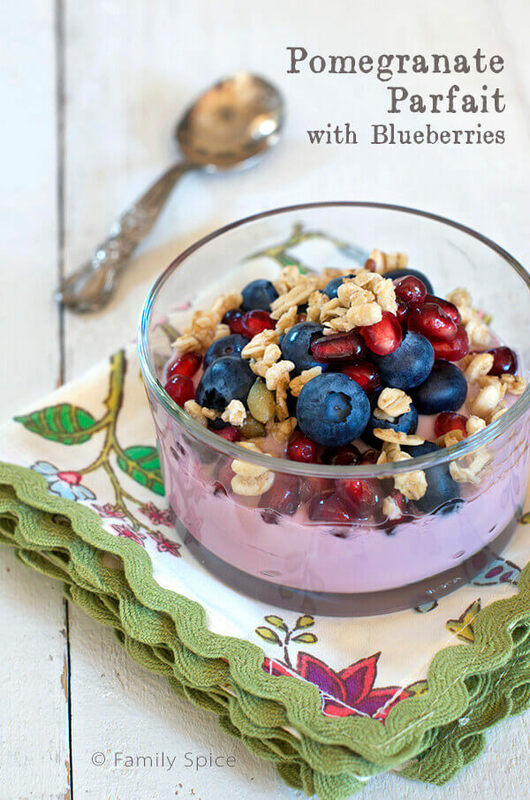 You can bet I will have more pomegranate recipes to share with you this month. 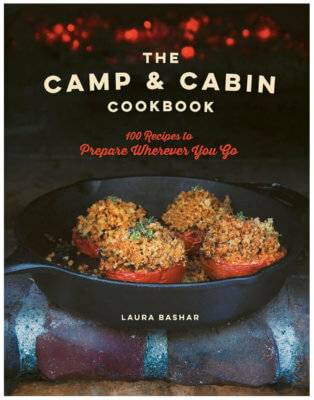 You can find what I have created so far and my recipes featuring pomegranates here. When water has come to a boil, add quinoa. Bring back to boil, then reduce heat to low and cover pot. Cook until done, about 12 minutes. Remove from heat and let quinoa cool, about 10 minutes if you like it warm. 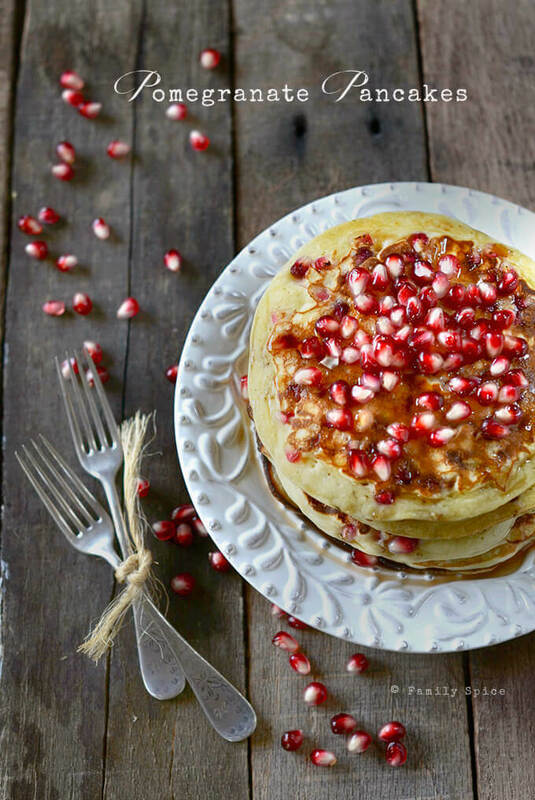 Cooking Tips: * You can substitute honey with agave nectar or pomegranate syrup. 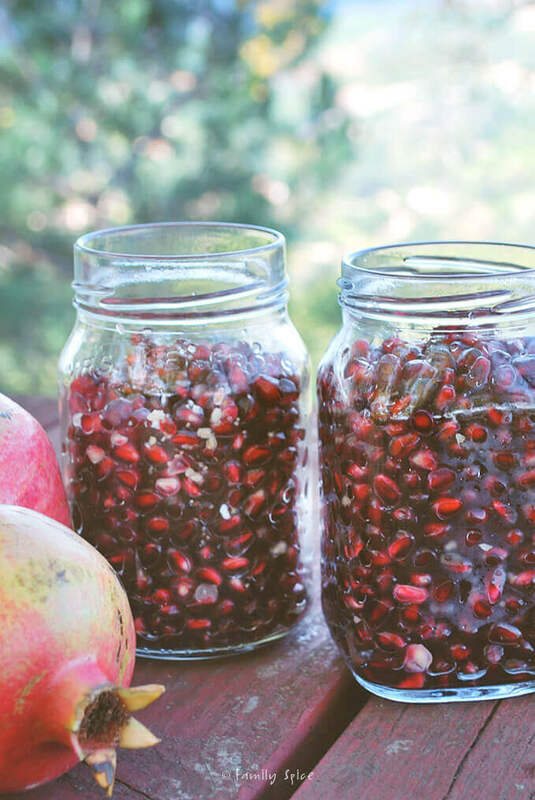 Oh you are such a lucky girl to pick all of the pomegranates you want. I would have thought I died and gone to heaven. the smoothie and salad look so amazing! We love pick your owns I can't imagine picking all of those heavenly pomegranates!